Even if we end carbon dioxide emissions today, effects could linger for hundreds, if not thousands, of years. And certain changes may already be irreversible. via U.N. climate change report points blame at humans – CNN.com. Scary words. If I worked in a corporate communications or sustainability department today, I would be planning ways to promote my responsible environmental behaviors in the coming weeks and months. This kind of news has a way to coming back around to those who hold the most responsibility. People want someone to blame, and research shows that the greatest amount of emissions come from energy and industry, as I mentioned in my earlier post. Many large corporations take environmental sustainability seriously, and they work to keep their emissions low. However, 50 companies are responsible for 73% of greenhouse gases, according to the CDP. They need to take notice and step up their efforts to minimize environmental impacts. Otherwise, the fear that this news creates will be redirected as anger toward the companies that have had the largest role in the problem. And what about policy? This is just the kind of news that creates more public will for energy and environmental policy. It comes on the heels of recent proposals by the EPA and the Whitehouse that will limit emissions from power plants and fund research into new clean technologies. Now would be a good time to propose more policies that move us toward renewable resources. 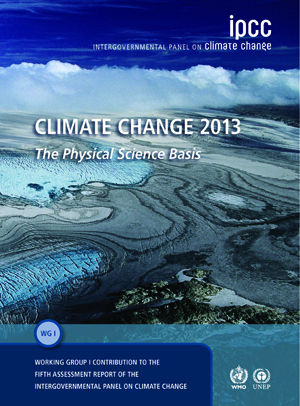 You can read the report at climatechange2013.org. This entry was posted in Energy, Public Relations, Sustainability and tagged climate change, energy policy, environment, environmental communication, global warming, sustainability, sustainability communication. Here’s an article written by one of the most energetic and fascinating people in sustainability communication, Lynnette McIntire at UPS (check out some of her work on the UPS blog). The article, titled Why I Love the Sustainability Report Assurance Process and published on Triple Pundit website back in August, shares McIntire’s appreciation for the utility of sustainability reporting. Public relations and communication groups are beginning to view the sustainability report as more than just an opportunity to talk about the good actions of a company. It is a management document that allows for greater accountability within the organization by identifying opportunities and holding the company accountable for responding to them. The document also can become a tool for media relations and activist communication by quantifying an organization’s performance improvements year over year. Producing a sustainability report requires a high level of investment from a company, and as McIntire says in the article, “gone are the days when carpooling and lighting upgrade stories and smiling volunteer photos made the grade. Now, credible companies talk about such contentious topics as human rights, climate change, racial diversity, sexual orientation and product responsibility.” Companies have the opportunity to take a closer look at their impact on society through the arduous process of compiling a sustainability report. Check out Lynnette’s work on the 2011 Sustainability Report for UPS. It is a model of goal setting and reporting. For those of you interested in how sustainability reporting can be leverage in social media, here is the Social Media Sustainability Index published earlier this year. It’s full of interesting examples of sustainability communication on the web, and I’ve found the material in the report to be somewhat useful for strategy development. This entry was posted in Public Relations, Sustainability and tagged environment, public relations, reporting, Social Media, sustainability, sustainable. Why the sudden focus on health? It appears that nonprofits do see the link between pollution and health, and I think the science would support that link. The link between melting ice caps and health is a bit more difficult to pin down. I appreciate that nonprofits are pushing the health message around the Coal Act, because it does, in fact, have consequences for the health of many Americans. This entry was posted in Public Relations, Sustainability and tagged climate change, environment, environmental communication, framing, health, nonprofits, sustainability communication. Earlier this week I wrote about the challenge of framing global warming effectively and how linking health to environmental damage could be a profitable strategy (see related NPR story). Turns out, only a couple of the largest nonprofits addressing global warming promote a clear relationship between the issue and human health. Philanthropedia released a report titled National Climate Change 2012 Top Nonprofit Ranking, and a quick review of the landing pages for the nonprofits found that only two mentioned health issues or in any way linked the environment and health. On one, the Union for Concerned Scientists is trying to Make Pfizer Feel the Heat by asking the public to express their disapproval for Pfizer’s funding of the Heartland Institute, a think tank that denies the link between health and global warming. The other, the Environmental Defense Fund website, prominently features Health as one of its main sections. I’m certainly not suggesting that public health be the most prominent message from environmental groups and nonprofits, but I do think they should talk about the impact of environmental changes on human health. If we can show the public how decisions toward the environment affect their health and the health of their children, I suspect they will be more sensitive to making the right choices. This entry was posted in Public Relations, Sustainability and tagged climate change, environment, environmental communication, framing, global warming, health, sustainability communication. NPR ran a great story this week on communicating about global warming. According to research by the Centers for Disease Control and Prevention, the public doesn’t react as strongly to messages about melting ice caps and endangered polar bears as they do to threats to their own health and the health of their children. So, what does this mean for sustainability communicators? It means that we might be using the wrong frames to motivate environmentally responsible behaviors. Do the symbols that we use for global warming miss the mark? We know that those who already care about an issue like global warming are more likely to pay attention and act on relevant messages, but that doesn’t help us motivate those who don’t care. The NPR article raises the possibility of tapping into the emotions of those who are apathetic about climate change, by connecting the issue with the reality of public health. Another interesting issue that the article raised was the credibility of those who typically promote environmental messages (politicians, environmental activists, journalists, etc.) vs. healthcare workers. Health officials, as the article says, are trusted more than other sources, and as a result their messages are more readily accepted. Considering this, environmental groups might find partnerships with health officials to be more effective than celebrity endorsements (not to diminish the effectiveness of this strategy with youth) to raise awareness of the consequences of environmental damage. As the article suggests, not everyone agrees that health and environment can be linked in this way, but one of the main proponents for this new strategy, Matt Nisbet, is quoted in the article. You can read more about his thoughts on communicating about climate change in an upcoming book that I edited with Lee Ahern titled Talking Green: Exploring Contemporary Issues in Environmental Communications. The scheduled publication date is mid-October. More to come. As a side note: Research that I conducted with Lee Ahern through the Arthur W. Page Center for Integrity in Public Communication at Penn State University looked at 30 years of environmental communication and found that ads tended to position environmental actions as good for the earth (rather than warning that lack of actions would lead to harm to the earth). And, the ads advocated for taking action (recycling, signing a petition, etc.) rather than conserving (using less water or electricity). See more articles about findings from this project here and here. This entry was posted in Public Relations, Sustainability and tagged environment, environmental communication, framing, global warming, health, page center, sustainability communication, talking green.